System provides nimble, efficient review of multi-centre clinical trials, while maintaining highest ethical standards,March 4, 2015 – A new ‘streamlined’ approach for the ethical review and oversight of multi-centre clinical trials in Ontario was launched today by Clinical Trials Ontario (CTO). The CTO Streamlined Research Ethics Review System allows any single ‘CTO Qualified’ research ethics board in Ontario to provide ethical review and oversight on behalf of multiple research sites involved in a clinical trial.The current approach in Ontario has been to conduct a research ethics review at each and every research institution participating in the same clinical trial. “The CTO Streamlined System provides a timely, efficient and effective approach for reviewing multi-centre clinical research in Ontario, while maintaining the highest standards for participant protection,” CTO President and CEO Susan Marlin said today at the launch of the new system. “This is a tremendous opportunity to enhance the environment for conducting multi-centre clinical trials in Ontario,” said Marlin.A stakeholder-led organization established by the Government of Ontario in 2012, CTO has been working with the clinical trials community over the past two years to design and build the CTO Streamlined System. The CTO Streamlined System can be used for both industry-sponsored and investigator-initiated multi-centre clinical trials and health research.All research ethics boards participating in the system are ‘CTO Qualified’ through the CTO REB Qualification Program. This program provides an external review of their governance, membership, operations and review procedures. The qualification process is important as it allows institutions and research ethics boards to feel confident delegating ethics review and oversight to each other. In recent months, several research ethics boards in Ontario have become CTO Qualified. One of those boards is already reviewing a newly-submitted clinical trial protocol. Facilitating the process is a web-based electronic platform called CTO Stream.“The new streamlined approach is expected to provide significant benefits to everyone involved in clinical trials by harmonizing processes and reducing the time and administrative burden involved in initiating research across multiple sites in Ontario. It will improve the speed and reduce the costs of doing multi-centre trials, while maintaining the highest ethical standards,” said Marlin. Clinical Trials Ontario (CTO) is an independent not-for-profit organization established by the Government of Ontario. 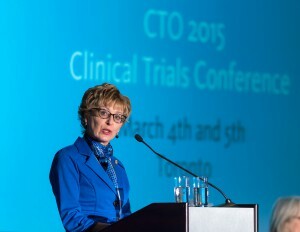 CTO’s mandate is to provide a streamlined approach to conducting multi-centre clinical trials in Ontario. The vision of CTO is to make Ontario a preferred location for global clinical trials, while maintaining the highest ethical standards for participant protection.